Human Renal Proximal Tubular Epithelial Cells (HRPTEpC) provide a useful tool for studying various aspects of pathology and biology of human kidney cells in vitro. 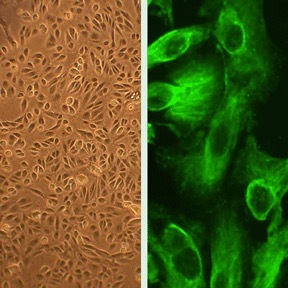 HRPTEpC from Cell Applications, Inc. have recently been used in a study of metabolic enzymes responding to energy depletion in renal cells, and they a pivotal role in kidney function including reabsorbtion of glucose and protein, and also play a part in the glucotoxicity associated with diabetes. Ito, H., O. Ichiyanagi, S. Naito, V. Bilim, Y. Tomita, Y. Kato, A. Nagaoka and N. Tsuchiya. 2016. GSK-3 directly regulates phospho-4EBP1 in renal cell carcinoma cell-line: an intrinsic subcellular mechanism for resistance to mTORC1 inhibition. BMC Cancer 16:393. Zhou, X., R. Liu, S. Duan, G. Huang, Y. Ye and Y. Kong. 2016. High Glucose Enhances oxLDL-Induced Apoptosis in Human Renal Proximal Tubular Epithelial Cells Largely via Inducing Lectin-Like ox-LDL Receptor-1. Pharmacology, 98:20-28. Jackson, E., D. Gillespie, Z. Mi, D. Cheng, R. Bansal, K. Janesko-Feldman and P. Kochanek. 2014.Role of 2′,3′-cyclic nucleotide 3′-phosphodiesterase in the renal 2′,3′-cAMP-adenosine pathway. Am J Physiol – Renal Physiol, 307:F14-F24. Jackson, E. and D. Gillespie. 2012. Extracellular 2′,3′-cAMP and 3′,5′-cAMP stimulate proliferation of preglomerular vascular endothelial cells and renal epithelial cells. Am J Physiol – Renal Physiol, 303:F954-F962.